Teacher gifts at the holidays don’t need to be expensive. Often the most meaningful gifts are ones your children help create, like this Christmas Mug Teacher Gift. Last year at Christmas time, my sons were only 3 1/2 and 1 years old, but I wanted to involve them in the creation of gifts for teachers and friends. I also wanted to be able to give the presents widely so I didn’t want them to be too costly to make. We decided to give small jars filled with a special cake mix you can make in a mug with just a little water and a minute in the microwave. Although I know many teachers are inundated with mugs at the holidays, I still decided to give a Christmas Mug Teacher Gift last year. I knew I wanted to give the cake mix in recycled baby food jars so I picked up festive mugs at my local dollar store since you need the mug to make the cake. My one year old contributed by emptying baby food jars (everyone needs a job to do, right?). My 3 1/2 year old helped by decorating gift bags with stamps and ink we also got at the dollar store and by filling the baby food jars. I did the rest. It was a team effort all the way around and cost less than $5 per gift. To increase the value we also put a Starbucks gift card in the mugs for my son’s two 3-School teachers. The jars were filled with 1-2-3 Cake, a recipe I first heard about from The Hidden Pantry. For 1-2-3 Cake, you combine any flavor cake mix with an angel food cake mix. Put three tablespoons in a mug, stir in two tablespoons of water and microwave for one minute. For our Christmas Mug Teacher Gift, I used Dark Chocolate cake mix, but you really can use any flavor cake mix for the 1-2-3 Cake. I tried it with red velvet cake mix at first, thinking it would look festively colored in the jar. Boy was I wrong! Red Velvet cake mix looks sort of brown in powder form, but then it was blood red when we made it. That was definitely not the look I was going for even if it was still delicious. 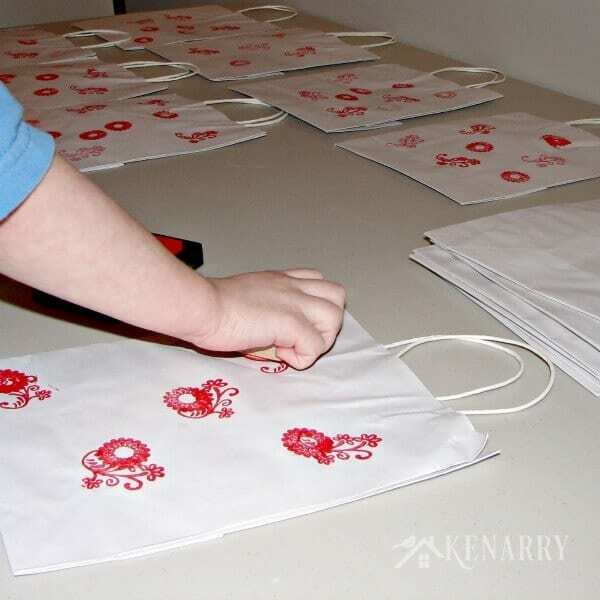 Have your child use the rubber stamps and red and green stamp pads to festively decorate white gift bags. My 3 1/2 year old loved doing this part because he could randomly create designs however he wanted. 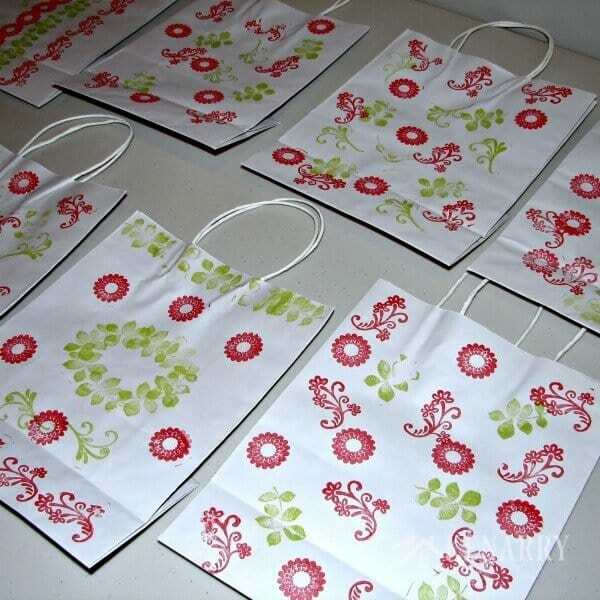 To prevent him from mixing the green and red ink, we did red first, let the bags dry and then added the green stamps. I knew the Christmas Mug Teacher Gift would be heavy. Since I got our white gift bags at a local dollar store, I used thick packing tape to reinforce the handles on the inside of the bags, so they wouldn’t break when the someone carries the gift. to remove any sticky residue from the side of the baby food jars. I just poured a little on a cotton ball and then rubbed until the glass looked as good as new. Then wash the jars in the sink or dishwasher to clean and sanitize them. Let the jars dry completely. 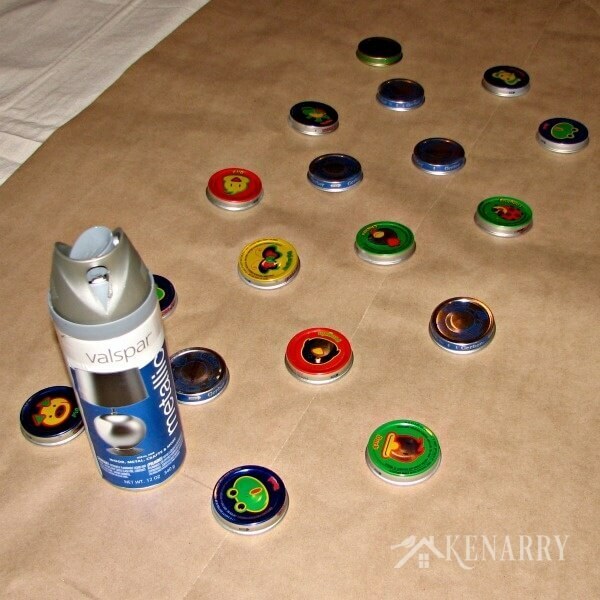 I then put several coats of silver metallic spray paint on the baby food jar lids to cover the words, pictures and marketing messages. Allow time to dry between coats. Be sure to spray the paint in a well ventilated area. 3. Fill the jars with cake mix. Gather the supplies you need including the jars and cake mixes. In a large bowl combine the regular cake mix and the angel food cake mix. 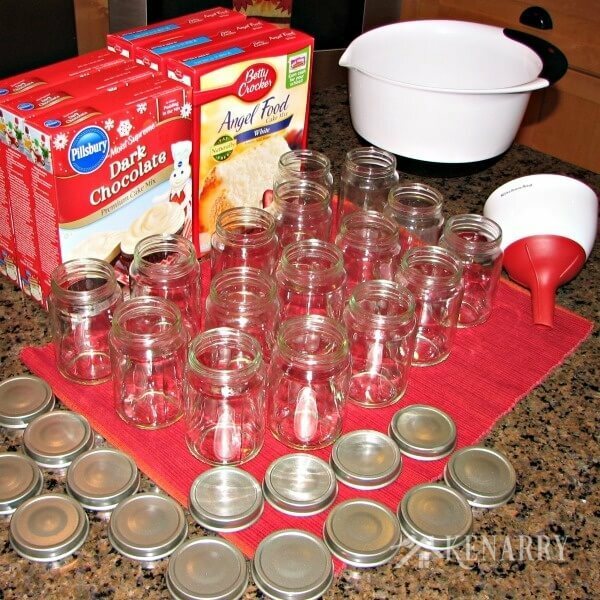 to fill each of the baby food jars. 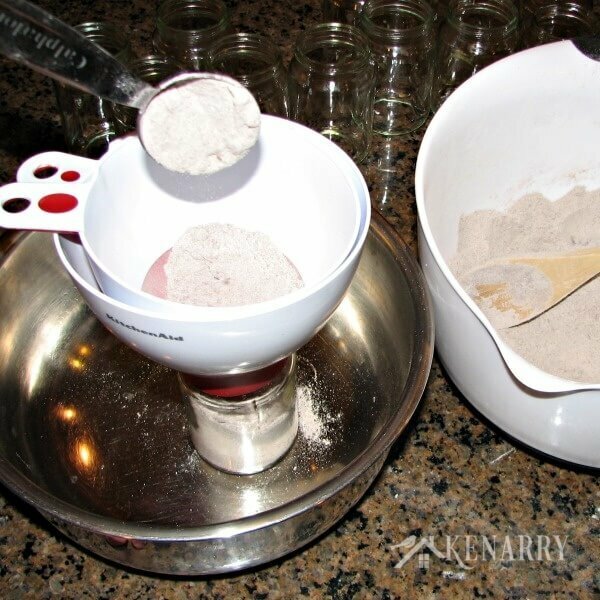 I had my son, who was three years old at the time help with this step, so I placed the jar inside another large bowl so we could catch any extra cake mix that fell outside the jar. We used a tablespoon to fill the mugs, so we could count the number of tablespoons. You need 3 tablespoons to create a 1-2-3 Cake, so make sure you put some mulitiple of 3 into each jar (e.g. 9 tablespoons, 12 tablespoons etc.). After you fill each jar, seal it with a lid. 4. Make instruction cards or get our free printable tags. If you use dark chocolate cake mix like I did, the instruction cards I used are available as a FREE gift when you sign up below! Then you just need to download the PDF file and save it to your computer. 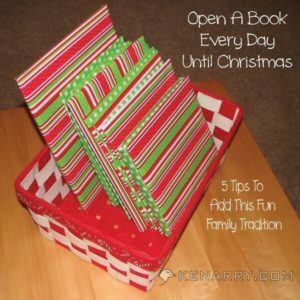 The instruction cards and all other free printables from Ideas for the Home by Kenarry™ are for your own PERSONAL USE ONLY. 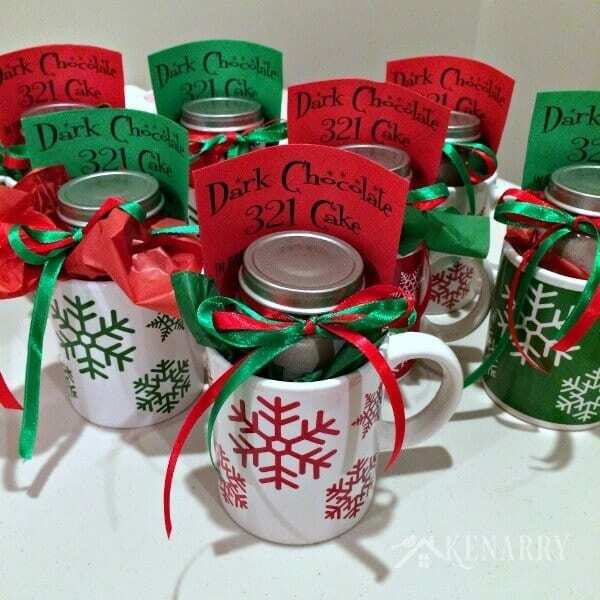 Once you have the file, print the 3-2-1 Dark Chocolate Cake-in-a-Mug instruction cards on red and green card stock. 5. 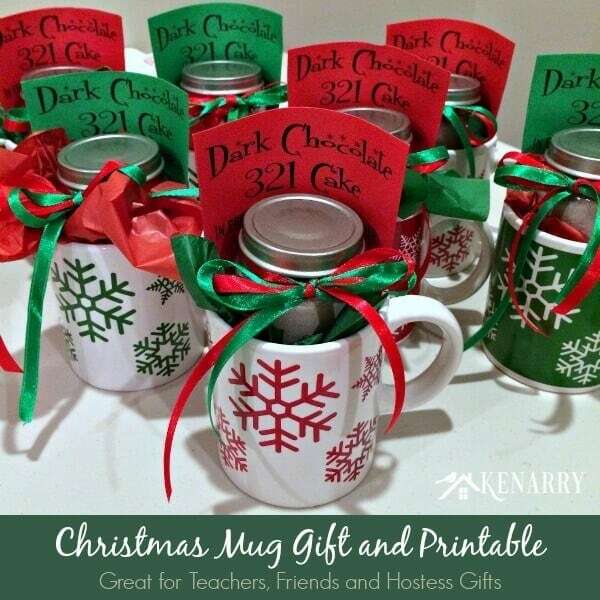 Wrap your Christmas Mug Teacher Gift. Tie red and green ribbon around the top of each jar. 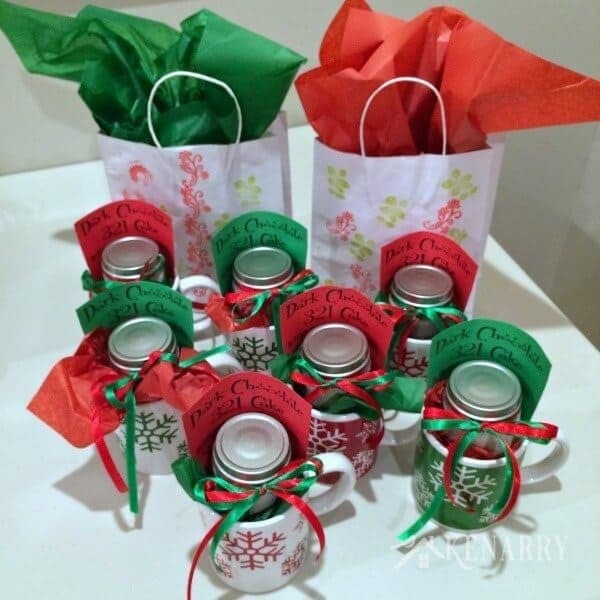 Put red and green tissue paper, filled jars and instructions inside each of the coffee mugs. 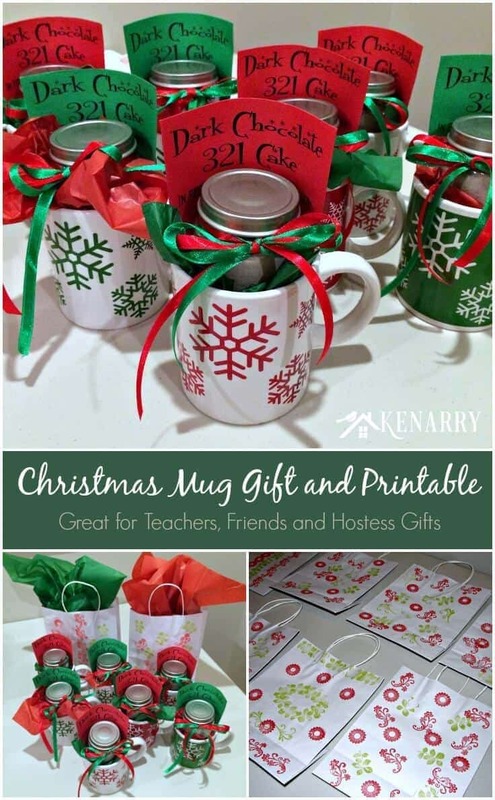 Put the Christmas Mug Teacher Gift in the gift bags you made with your child earlier and you’re ready to give your presents to teachers, friends and hostesses! In addition to giving these to my son’s teachers for Christmas, I also gave these as gifts to my friends in Bible study and on the Women’s Service Day organizing committee with me. All the recipients were delighted to see how my sons were involved in their gifts. More than anything, though, it was a great way to teach my sons about giving to others at Christmas time. These cute Printable Candy Bar Wrappers would also be a great addition to the mugs! How have you involved your kids in making their teacher gifts for Christmas? Please comment below and share – we need some new ideas for this year! 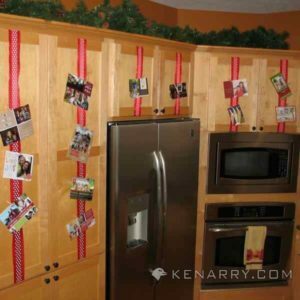 For more great ideas, follow our Christmas Ideas Board on Pinterest. 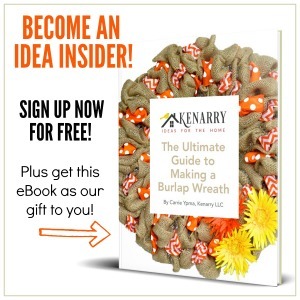 Carrie is the chief writer, crafter and cook here at Ideas for the Home by Kenarry™. 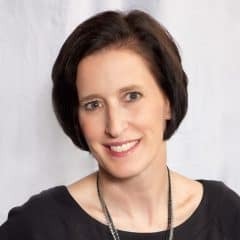 She’s an optimist by nature and enjoys sharing recipes, trying new craft ideas, planning for parties and events as well as organizing and decorating. When she’s not blogging, preparing meals or picking up around the house, you’re bound to find her hidden away in a castle under the stairs reading to her two young boys. Whether you’re cooking, crafting or creating for your family, follow Carrie on Pinterest, Facebook, Twitter, Google+, and Instagram to get inspiring ideas for your home. Thanks Leigh Anne! My dollar store mugs can’t compare to your stenciled ones, though! Now THOSE are a work of art! I love this idea. Thanks for sharing. I have to wait awhile till my great grandson gets older to get the jars. Maybe next year. I saw this on Pinterest and had to take a look. We’ve been doing this for years. I found it in a holiday book somewhere. We usually pick up Christmas mugs at either the Dollar Store or Goodwill, and then I get the treat bags with the twist ties from the Dollar Store or the Christmas-y themed ziplock sandwich baggies for the cake mix. One year I got super fancy and printed the instructions on vellum and then cut out tags with scrapbook paper and stuck the vellum over the scrapbook paper tags. Every year that we do it, the teachers just go nuts and think it’s a great idea! Hi Amanda, thank you so much for sharing ideas for how you’ve done this in past years. I love the fancy way you added vellum into the tags. I bet they turned out super cute! No wonder the teachers go nuts over it. I adore this idea. Wish I knew someone with baby jars. Thank you so much for sharing. Thanks Ivory! If you don’t have access to baby food jars, I bet any small food jars would work. Just start collecting as you use them for your everyday cooking.